VOCs evaporate into the environment and cause photochemical smog which is why our government has created rules restricting the production and use of these chemicals. However, low or no VOCs should NOT be equated with health, safety or 'non-toxic'. Why not? Because VOCs are only part of the total number of chemicals in a can of paint or finish. 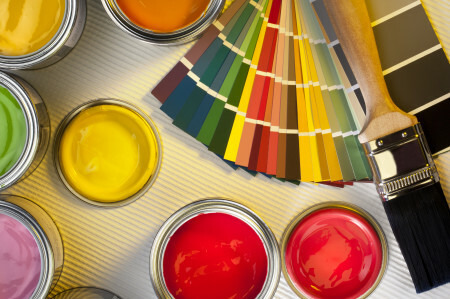 Most paints and finishes contain other chemicals which are not classified as VOCs or have been de-regulated but they may still be harmful to your health. This article discusses what some paint companies don't want you to know about their paint. Acetone and ammonia, which are hazardous to human health, are not classified by the EPA as VOCs. Why? Because they don't cause smog. Hmmm. They may smell terrible and not be good to breathe but the EPA says, if it does not cause smog, we are not concerned about it. There are hundreds of similar chemicals used in building materials which have been de-classified as VOCs so they fly under the radar of the EPA. VOCs have been linked to numerous physical disorders such as eye, nose and throat irritation, headaches, loss of coordination and nausea, and damage to liver, kidney and central nervous system. VOCs can out-gas and contaminate both indoor and outdoor air for five years or more after the product has been applied. And VOC levels are typically 2-5 times higher indoors as they are outdoors. You read that right. Clearly, reducing and avoiding VOCs is a smart thing. But what about the potentially hazardous chemicals not classified as VOCs? Fungicides and biocides are chemicals used to prevent mildew growth and to extend the shelf life of a product, but they are not classified as VOCs. They may be good for the paint, but they're not necessarily good for your health. The EPA classifies fungicides and biocides as "pesticides." Small concentrations of poisons may not produce an odor or cause any immediate irritation, but they can leach out under the right conditions or interact with other chemicals. Over time, the accumulation of these toxins can eventually end up in our water system and be difficult to eliminate. Pigments are designed to color the paint but some contain toxic chemicals. In fact, on Oct. 25, 2012, both Sherwin Williams and PPG settled charges by the FTC that they misled consumers into believing their paint was free of VOCs. "According to the agency, while this may be true for the uncolored “base” paints, it is not true for tinted paint, which typically has much higher levels of the compounds, and which consumers usually buy." One popular brand name no VOC paint contains crystalline silica (not classified as a VOC). Crystalline silica is an occupational hazard that has been shown to produce cancer in rats and perhaps in humans, yet the paint was awarded a "Green" label. In addition, some paint companies, in their quest to reduce VOCs, have added masking agents to cover up the offensive paint smell! Beware: just because a company claims its paint has fewer VOCs or doesn't smell does not mean its paint is non-toxic. What happens during manufacturing and demolition? The reduction of VOCs also does not address the deeper human and environmental issues surrounding the life cycle of paint including its production, use and eventual destruction. According to William McDonough and Michael Braungart in their landmark book Cradle to Cradle, "...being 'less bad' is no good." They say, "Cutting the amount of toxic waste created or emitted...is a central tenant of eco-efficiency. But reduction in any of these areas does not halt depletion and destruction — it only slows it down, allowing them to take place in smaller increments over a longer period of time. Current studies show that astoundingly small amounts of dangerous emissions can have disastrous effects on biological systems." This is true for paint emissions during the manufacturing process as well as during incineration. The creation of dangerous particulates during the destruction of older buildings can release a variety of contaminates into the air, water and soil that may go undetected for years — adding to the depletion of the environment. Consider this: if a home lasts a hundred years or so, normal maintenance will require thousands of gallons of primer, paint, sealers, stains and other finishes utilized from floor to ceiling and from wall to wall. McDonough and Braungart say, "Air, water and soil do not safely absorb our wastes unless the wastes themselves are completely healthy and biodegradable. We have just too little knowledge about industrial pollutants and their effects on natural systems for 'slowing down' to be a healthy strategy in the long term." Let's consider a more creative approach. Instead of asking how to reduce the problem of toxicity in paint, shouldn't we ask how to create a paint that's healthy? Or is there an alternative to paint that's better for the inhabitants and the environment both now and in the future? Using the Mcdonough/Braungart eco-effective model of waste equals food, shouldn't our wall and floor finishes be made of a material that is totally non-toxic and biodegradable, not just free of VOCs? In the past, and even today, there are cultures that finish their floors, walls and ceilings with a variety of natural materials such as organic lime washes, clay plaster, straw/mud combinations, milk paint, natural oils, bees wax and other indigenous resources. 2) naturally-derived formulas which use only raw materials including citrus peel extracts, essential oils, seed oils, tree resins, inert mineral fillers, tree and bee waxes, lead-free dryers and natural pigments. Most of the ingredients have been used for centuries and are renewable, low in toxic substances and feature a low environmental footprint. Both of these methods have been formulated and manufactured with children, the elderly and the chemically sensitive in mind. Many doctors recommend these paints to their patients who suffer from allergies, sick building syndrome or multiple chemical sensitivities. Our customers tell us again and again how wonderful these eco-friendly products are to work with and how much easier it is to breathe during the painting process and after completion. ECOS, for example, is the first paint manufacturer to have a DECLARE label and be Red List Free. The DECLARE label is 100% transparent and lists all chemicals used. The red list, created by the International Living Future organization, is a list of 800 worst-in-class chemicals spanning twenty-two classes of chemicals prevalent in the building industry that pollute the environment, bio-accumulate up the food chain until they reach toxic concentrations and harm humans, plants or animals. AFM has been awarded a Gold Certification by SCS which does third-party certification for building products. Almost every day we hear from customers who complain about low or no VOC paints that continue to off-gas dangerous fumes into their homes and who can't tolerate being in the room or home any longer. Some move out, others continue to suffer. These same people can almost always tolerate our paint products. Even so, we always recommend that you test a product for your own tolerance levels before using it. Our finishes do not contain any known hazardous ingredients, regulated VOCs as well as de-regulated VOCs; this means no ethylene glycol, formaldehyde, acetone, ammonia, crystalline silica, biocides or fungicides. For your convenience, we have provided MSDS sheets which are reports about the ingredients of each product. We have also included information about application methods, tips on where to use each product and a toll free number if you don't wish to read all this. We stock most of the popular finishes. We can also match most popular brands. Sample sizes of most products are available for testing. Feel free to contact us about any large jobs for special pricing. Copyright © 2017 Joel Hirshberg All rights reserved.